A man who was so drunk he couldn't make himself understood while trying to order tacos at a Brighton Center restaurant and who then got back into his car and drove off was ordered held without bail at his arraignment today on his sixth OUI charge, the Suffolk County District Attorney's office reports. Read more. 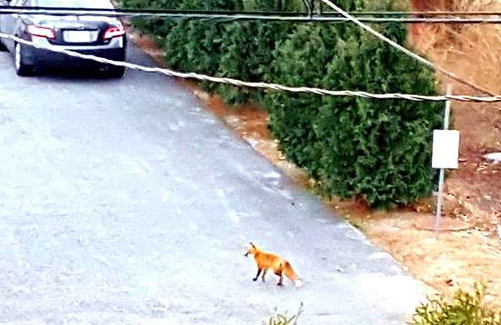 Roving UHub photographer Karen Bidwell spotted this fox (not in socks) on Oakland Street near Brighton Center late this afternoon. Brighton residents and Ernest Prussman's surviving relatives gathered at Murdock and Cambridge streets this afternoon for the formal unveiling of a statue in his honor - along the route he took every day to get to Brighton High School across the street. Read more. A sushi place in Brighton Center goes before the Boston Licensing Board on Wednesday for permission to let customers bring in their own wine and beer. Read more. Alex Byer couldn't help but notice the new plywood that's gone up on a vacant storefront on Washington Street at Winship Street. 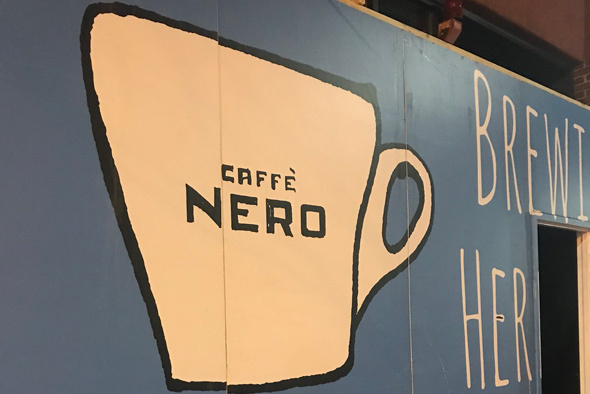 Brighton Center already has several places to get a cup of coffee, but none of them spell it "caffè." Read more. Rendering by architect with fascination for circling vultures. 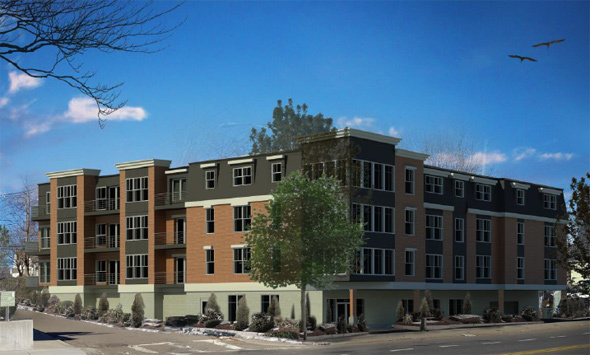 A developer has proposed replacing a vacant five-unit building at 81 Chestnut Hill Ave., at William Jackson Avenue, with a 15-unit residential building. Read more. Police were stumped this afternoon by a large piece of tree trunk that wound up at the intersection of Washington Street and Chestnut Hill Avenue. Rick watched a mighty woodsman dispatch the errant wood. The BPDA board yesterday approved a 660-unit "mid-market" development on the old St. Gabriel's site off Washington Street and behind St. Elizabeth Medical Center, in a move that could also lead to the creation of a new, privately funded Allston/Brighton bus line. Read more. This guy stood on the traffic island in Brighton Center early this evening, rooting on the Patriots, and, we suspect, settling a bet. Joseph Rachal, 65, of Everett, was sentenced today to 101 months in federal prison for holding up a Brighton Center bank branch at gunpoint in 2015, the US Attorney's office reports. Read more. Nichole Davis reports no power in Brighton Center; power's actuallly out from the Brookline line on Washington Street to Oak Square, possibly due to a fire in the hole at 1709 Comm. Ave.
Eversource's outage map was showing 4,500 Boston customers without power as of 5:55 p.m. Eversource says it hopes to have power back on by 7:15 p.m.
An exchange of words over a drink spilled on the DJ's equipment at Porter Belly's, 338 Washington St., last month ended up as an all out assault on the DJ, who had to be taken to nearby St. Elizabeth's for treatment, a Boston Police sergeant and a pub manager said today. Read more. Codman Square and Brighton suspects. The FBI's Bank Robbery Task Force is investigating two recent bank robberies involving a man telling a teller he's packing a bomb. Read more. 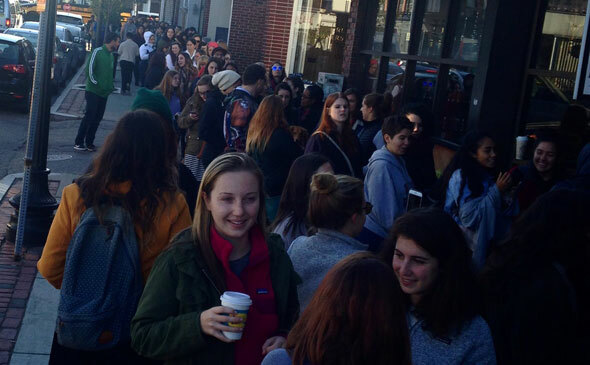 Gilmore Girls fans flooded Brighton Center this morning, as RoadTrip New England shows us for Cafenation's one-day transformation into Luke's, where people who got in got free coffee in a Luke's cup. The BRA board yesterday approved a mixed-use building at Washington and Parsons streets that will include 54 housing units, a small Roche Bros. and 125 parking spaces. Police aren't saying just what it was that ticked off members of the Bromley-Heath gang, but whatever their problem, the result was a brutal attack that sent a 20-year-old man inside the Green Briar Pub to nearby St. Elizabeth's Hospital on Jan. 24. Read more.